Seoul ironically has no shortage of Auntie Anne’s, but if you’re near Gangnam and feeling for something new, I highly suggest Ring Bar Ball. Awkward names aside, I was drawn to this place by the alluring smell of fresh dough baking and couldn’t resist giving it a shot! 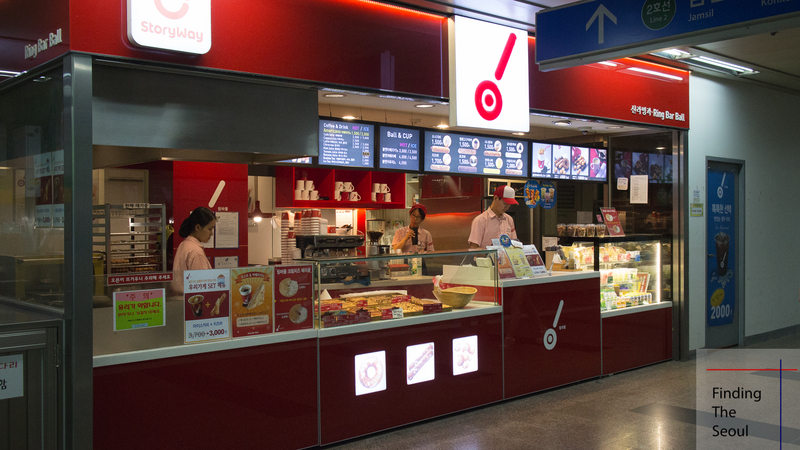 They’re a small franchise with 5 locations located south of the river. Most of them are located in subway stations, so admittedly it might not be easy coming here unless it’s on the way. The one I frequent is in Seolleung Station, where the Bundang line (분당선) goes north. If your subway station happens to have one, I’m sure you’ll be unable to resist the enticing smells too! 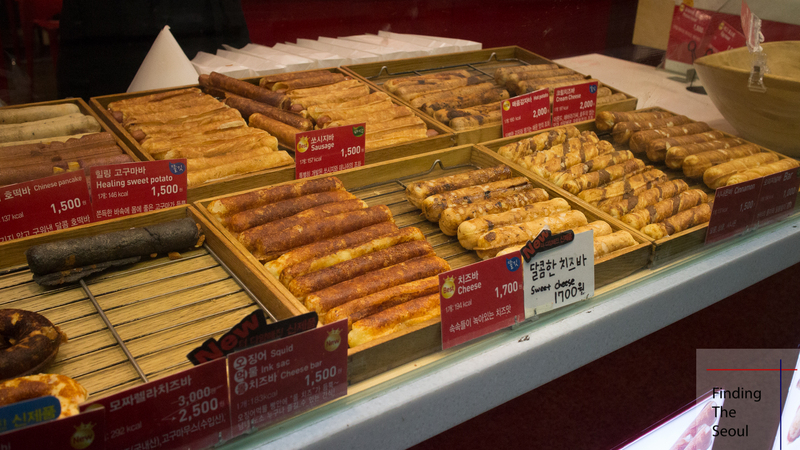 They bake everything in-house and the prices are quite reasonable. I think they use a puff pastry dough and wrap it around other delectable ingredients baking it to a golden brown. 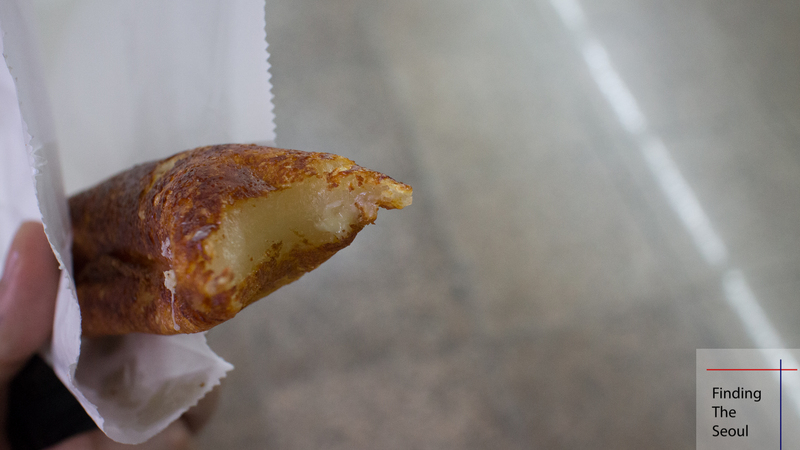 The result is a crispy little pastry with a delectable filling! Sausage – 1500 won The sausage is one of my favorites. They use a sausage with a substantial skin that gets crispy with the pastry. It’s salty, but not overbearingly so. The outer crisp of the pastry and soft delicate inner dough combined with the saltiness of the sausage compliment each other well. 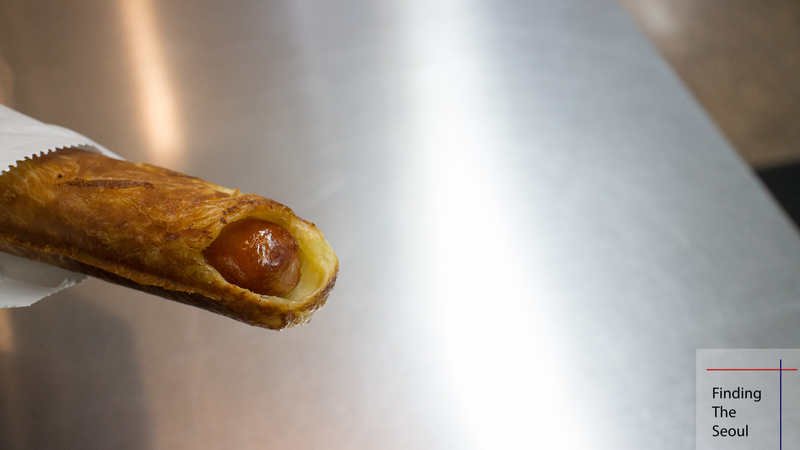 If you like pigs in a blanket, you will go crazy over this! Another fave of mine is the cheese. It’s a bit more like a crepe. There’s not so much of a crisp as it has the texture of a browned crepe. The cheese seems to fuse with the dough making for a chewy, cheese roll. The cheese is pretty subtle, but it still goes well with the subtle aroma of the dough. One thing to look out for like with most pastries, is that they get significantly worse as they sit. Fresh out of the oven, they taste absolutely amazing, but I have had some that have been sitting around a little bit longer. They’re still good, but they just don’t have the same wow factor. If you have any other pastry places to share or love this place as well, please leave a comment below!